Are you seeking for the best magazine WordPress themes for your online magazines, blogs or news? Then here is the collection of the some of the best magazine WordPress themes. These are the perfect themes if you want to create an awesome looking online magazine for any niche. These days the growing popularity of going digital has taken a toll on some careers. Nowadays, many writers have lost their jobs because their companies have been folded. Because people prefer to read the news from trusted through online sources. So, its very important to have an online presence. Mainly, the magazine themes are used for magazine websites, news portals, and blogs. These type of themes are very necessary for magazine websites and any other medias to make beautiful contents and engaging layouts to attract the visitors. And also, the theme should be responsive and customizable to help build an eye-catching and engaging magazine website. Here, I’ve tried to list down some of the best magazine WordPress themes that comes with many advanced and powerful features. With the help of these amazing features you can build a perfect website easily in no time. VMagazine is a powerful WordPress Theme for creating online newspapers, magazines and blogs websites. This theme comes with 10 beautifully designed demos that can be imported in one click. And, you can also create your own layout by using the prebuilt modules as per your requirements. It is built with the latest WordPress technology and is highly customizable. Newspaper is a premium WordPress magazine theme for blogs, news, and magazine websites. It is an excellent choice for your site as it comes with a modern, responsive, and retina ready design. With this theme, you can visually enhance your website using images displayed in a carefully crafted lightbox gallery, or embedding videos from YouTube, Vimeo, and Dailymotion. NewsAnchor Pro is a beautifully designed WordPress magazine theme that gives you a fresh and modern look. The theme also has many color options available where you can select the required color of your choice. About 650+ Google fonts are supported to the theme. It comes with many options such as built-in widgets that can be used to display the important sections. Nexus is a versatile magazine WordPress theme packed with amazing custom widgets and stunning content modules. This theme is capable of displaying a massive amount of content in a clean and mannered way. Moreover, this theme is perfectly suited for your online magazine, news portal, affiliate site or personal blog and other creative websites. NewsMag Pro is a premium news magazine WordPress theme that showcases your visual in styles using the custom widget. It is the combination of great design and delightful support. Moreover, it features 4 eye-catchy custom sliders – choose a different one for displaying your visuals. Featured is a premium magazine WordPress theme that comes with many powerful options. This theme features multiple pre-built layouts for creating feature pages, posts, categories, and others. Moreover, this theme is perfect for crafting stunning WordPress stunning blogs, magazine or news website. Editorial Pro is a premium magazine WordPress theme which contains a fully responsive layout, outstanding design and many features like typography option, new extra widgets with multiple layouts, demo importer & much more. This theme is extremely suitable for gamers, news, magazine, Ad, review and blogging websites. GreatMag Pro is a beautiful magazine WordPress theme that comes with lots of exciting features. This theme is perfect for online magazines or blogs. It includes many advanced customization options that let you design the site just the way you like. And, the theme comes with a fully responsive layout that looks awesome on all the screen sizes. Sahifa is one of the most versatile premium WordPress news/magazine theme in the world. This amazing product offers many incredible features, each added in order to enhance your web page. It manages to balance power and beauty, resulting in a high-quality browsing experience for all users. Many sites have to choose between complexity and accessibility, given that their layout cannot adapt to the diminutive screens of hand-held devices. Hestia Pro is a unique and responsive magazine WordPress theme with a clean and customizable design. This theme is highly powerful and has tons of powerful features and functions. It is perfect for news, newspaper, magazine, publishing or other editorial websites. SwagMag is a premium magazine WordPress theme that allows you to create unlimited custom reviews. The entire jQuery and user interface are upgraded to provide the best experience to the user. Monte is a premium magazine WordPress theme that gives full flexibility and tons of powerful features to craft your website. This theme is an elegant magazine-style WordPress theme designed exclusively for fashion bloggers. Monte’s responsive layout looks beautiful on all devices and features pixel-perfect design & typography. NewsPaper Pro is a premium newspaper WordPress Theme that is fully responsive and has been designed to cater to news websites. This theme includes unlimited color options so, choose the color that you want on your site. It is well coded theme that makes easier for everyone to use the theme perfectly. VMag Pro is an elegantly designed premium WordPress magazine theme ideal for online newspaper, magazines, journals, professional blogs and other review publishing sites. It is an easy-to-use theme enriched with powerful features and functionalities. The theme is loaded with tons of customization possibilities and multiple options, the theme allows you to configure most of its element with live preview. Buzz is a modern premium WordPress theme with a clean news-magazine style. It comes with a drag and drop page builder that allows you to design and position your content with an ease.With this intuitive theme, without any coding skill you can edit and design every area of your site. This theme automatically adapts on any screen mode from a gigantic desktop to a mobile or tablet. Maggie Pro is a premium WordPress magazine theme carefully designed for creating a newspaper, editorial, online magazine, blog or personal websites. It is a fully responsive theme that works fluently with any device, any browser, and any platforms. The theme comes with a clean and modern design. It comprises lots of exciting features such as 2 post layout, author block, large featured images for page/post, social media integration, colorful category background and much more. Sportsmag Pro is a sleek and responsive WordPress theme for online news-magazine. This beautifully designed theme is ideal for the newspaper, editorial, online magazine, review site, blog or personal website. The theme features 5 different post layouts, author block, inbuilt rating system, large featured images for page/post, social media integration for wider social reach. 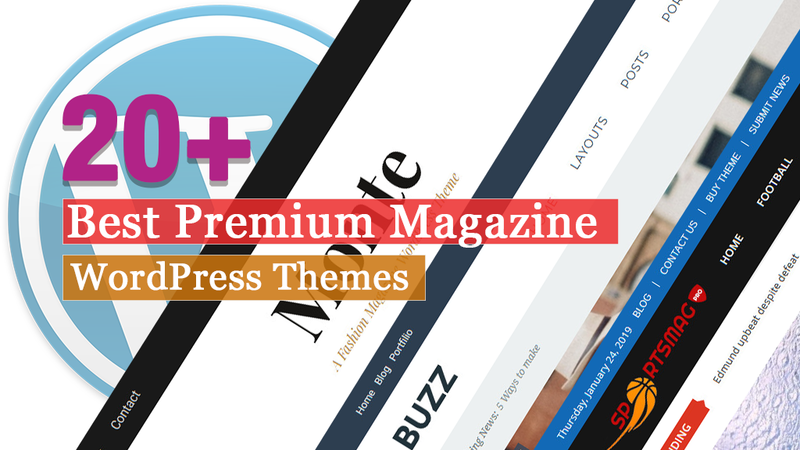 AccessPress Mag Pro is a Premium Magazine WordPress Theme, which suits for online magazines, newspapers, editorial, blog etc. It is a highly professional theme with a great design and powerful support for launching a site. This theme lets you customize theme settings and design completely from the theme options panel. It is optimized for search engines, ready for localization and all WordPress plugins compatible. TrueNews is a brilliant Premium WordPress News/Magazine Theme. It is a fully responsive theme with widgetized homepage where you can add several widgets as per your requirement and make your site more worthy. Anybody without advanced programming knowledge also can build a superb website with this user-friendly theme within a few minutes. It comes with drag and drop content builder so it’s really easy to manage your homepage content and display it in an elegant way. Magazine is a creative WordPress news magazine theme best suited for any sort of online magazine, newspapers, editorials, journals or other reviews publishing websites. It has included all the essential features and functionalities to let you built a complete and well-qualified website. It offers large homepage sliders, multiple layout options, unlimited color options and many more with which you can create a delightful site within no time. NewsPress is a fabulous premium news magazine-style WordPress theme loaded with advanced features and functionalities. It is a simple, clean and user-friendly theme as it is powered by CSS3 and is well compatible to latest WordPress version. It includes custom logo, login, and membership registration to let you personalize your site. The theme functions well with all devices, all platforms, and all major browsers also, you can translate it into any language of your choice. This is the collection of some of the best magazine WordPress themes that comes with many advanced and powerful features. Not only that it also includes beautiful designs that let’s you design awesome looking website easily. If you have any queries or suggestions related to the theme then feel free to comment us below. Or, have used these themes already then share us your experience with us.